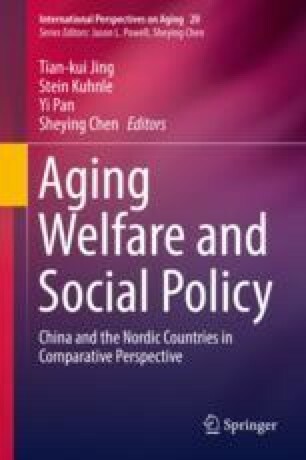 In recent years, China has experienced rapidly increasing demand for old age care and relevant services for elderly people, as a result of the rapid growth in China’s older population (Peng, 2013). According to the 2015 Social Service Development Statistical Communique (Ministry of Civil Affairs, 2016), by the end of 2015, China’s population aged 60 and over had reached 222 million—equivalent to 16.1% of the total population. Further, the population aged 65 and over had reached 143.86 million—about 10.5% of the total population. According to an estimate by Hu and Yang (2012), the actual old age dependency ratio reached 5:1 by 2012, which is a greater level of dependency than the 8:1 estimated by the official statistics. This ratio will reach 3.5:1 by 2020. According to the estimate of the 2013 Human Development Report of China (UNDP China, 2013a, 2013b), by the end of 2011, some 9.1% of Chinese people were older than 65. According to this report’s estimate, this figure will rise to 18.2% by 2030—higher than in most industrialised countries. In addition to the demographic changes, China’s old age care services are challenged by the country’s changing social and economic situations. As the overall income increases, older people’s lifestyles and demand for cultural activities are also different to those of the past. Older people have begun to demand more convenient, more varied and higher quality services and facilities. These changes have created serious challenges for the existing old age care system.